Bourges Cathedral (French: Cathédrale Saint-Étienne de Bourges) is a Roman Catholic church located in Bourges, France. The cathedral is dedicated to Saint Stephen and is the seat of the Archbishop of Bourges. It is in the Gothic and Romanesque architectural styles. The site occupied by the present cathedral, in what was once the northeastern corner of the Gallo-Roman walled city, has been the site of the city's main church at least since Carolingian times and probably since the foundation of the bishopric in the 3rd century. The present Cathedral was built as a replacement for a mid-11th-century structure, traces of which survive in the crypt. The date when construction began is unknown, although a document of 1195 recording expenditure on rebuilding works suggests that construction was already underway by that date. The fact that the east end protrudes beyond the line of the Gallo-Roman walls and that royal permission to demolish those walls was only granted in 1183 shows that work on the foundations cannot have started before that date. The main phase of construction is therefore roughly contemporaneous with Chartres Cathedral (begun 1194), some 200 kilometres (124 miles) to the northwest. As with most Early- and High-Gothic cathedrals, the identity of the architect or master-mason is unknown. The choir was in use (though not necessarily complete) by 1214 and the nave was finished by 1255. The building was finally consecrated in 1324. Most of the west façade was finished by 1270, though work on the towers proceeded more slowly, partly due to the unfavourable rock strata beneath the site. Structural problems with the South tower led to the building of the adjoining buttress tower in the mid-14th century. The North tower was completed around the end of the 15th century but collapsed in 1506, destroying the Northern portion of the façade in the process. The North tower and its portal were subsequently rebuilt in a more contemporary style. 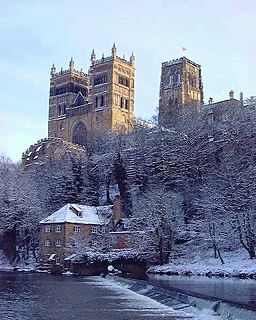 Important figures in the life of the cathedral during the 13th century include William of Donjeon who was Archbishop from 1200 until his death in 1209 (and was canonised by the Pope in 1218 as St William of Bourges) as well as his nephew, Philip Berruyer (archbishop 1236-61), who oversaw the later stages of construction. Following the destruction of much of the Ducal Palace and its chapel during the revolution, the tomb effigy of Duke Jean de Berry was relocated to the Cathedral's crypt, along with some stained glass panels showing standing prophets, which were designed for the chapel by André Beauneveu. Generally the cathedral suffered far less than some of its peers during the French Wars of Religion and in the Revolution. Its location meant it was also relatively safe from the ravages of both World Wars. The cathedral was added to the list of the World Heritage Sites by UNESCO in 1992. Bourges Cathedral covers a surface of 5,900 square metres (7,100 sq yd). The cathedral's nave is 15 metres (49 ft) wide by 37 metres (121 ft) high; its arcade is 20 metres (66 ft) high; the inner aisle is 21.3 metres (70 ft) and the outer aisle is 9.3 metres (31 ft) high. The use of flying buttresses was employed to help the structure of the building. However, since this was a fairly new technique, one can easily see the walls were still made quite thick to take the force. Sexpartite vaults are used to span the nave. Bourges Cathedral is notable for the simplicity of its plan, which did without transepts but which adopted the double-aisled design found in earlier high-status churches such as the Early-Christian basilica of St Peter's in Rome or in Notre Dame de Paris. The double aisles continue without interruption beyond the position of the screen (now largely destroyed though a few fragments are preserved in the crypt) to form a double ambulatory around the choir. The inner aisle has a higher vault than the outer one, while both the central nave and the inner aisle have similar three-part elevations with arcade, triforium and clerestory windows; a design which admits considerably more light than one finds in more conventional double-aisled buildings like Notre-Dame. This design, with its distinctive triangular cross section, was subsequently copied at Toledo Cathedral and in the choir at Le Mans. The flying buttresses surrounding the cathedral are relatively slender and efficient, particularly compared to the contemporary but much heavier flyers at Chartres. Their steep angle helps to channel the thrust from the nave vaults and the wind loading on the roof to the outer buttress piers more effectively. The west façade is on a particularly grand scale when compared to earlier cathedrals. The four side aisles and central nave each have their own portal reflecting the scale of the spaces beyond. As is often the case with Gothic churches, the central portal carries sculpted scenes related to the Last Judgement, whilst the south portals are dedicated to the lives of saints - here St Ursinus and St Stephen. The north portals were destroyed when the tower collapsed but surviving fragments indicate that their sculptural programmes were dedicated to the life and death of the Virgin. Unifying all five portals is a dado screen of gabled niches which stretches the whole width of the façade. The spandrels between these niches feature an extended Genesis cycle which would originally have told the story from the beginning of Creation to God's Covenant with Noah. Romanesque carved portals from about 1160-70, probably intended for the façade of the earlier cathedral, have been reused on the south and north doors (occupying the spaces normally reserved for transept portals). Their profuse ornamentation is reminiscent of Burgundian work. The astronomical clock of Bourges Cathedral was first installed in November 1424, during the reign of Charles VII, when the royal court was based in Bourges, for the occasion of the baptism of his son the Dauphin (the future Louis XI). Designed by the canon and mathematician Jean Fusoris and constructed by André Cassart, the clock is housed in a belfry-shaped case painted by Jean Grangier (or Jean of Orléans). The clock's bells chime on the quarter hour, and chime the Salve Regina on the hour. The clock was restored in 1782, 1822, 1841, and completely overhauled in 1872, when the upper dial showing only the time was installed. The zodiac calendar was restored in 1973. The clock was badly damaged by fire in 1986; after a complete restoration, the clock was reinstalled in 1994 with a replica mechanism. The original mechanism is on display in the cathedral. Apart from the axial chapel, Bourges Cathedral retains most of its original ambulatory glass, which dates from about 1215 (around the same time as Chartres Cathedral). The glazing programme includes a famous Typological window (similar to examples at Sens and Canterbury), several hagiographic cycles, the story of the Old Testament patriarch, Joseph and symbolic depictions of the Apocalypse and Last Judgement. Other windows show the Passion and three of Christ's parables; the Good Samaritan, the Prodigal Son and the story of Dives and Lazarus. The French art historian Louis Grodecki identified three distinct masters or workshops involved in the glazing, one of whom may also have worked on the windows of Poitiers Cathedral. ^ Bony, Jean (1985). French Gothic Architecture of the Twelfth and Thirteenth Centuries, p. 212. University of California Press. ISBN 0-520-05586-1. 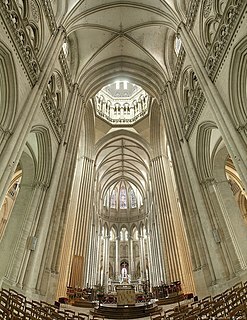 Wikimedia Commons has media related to Bourges Cathedral. The Cathedral Basilica of Our Lady of Amiens, or simply Amiens Cathedral, is a Roman Catholic church. The cathedral is the seat of the Bishop of Amiens. It is situated on a slight ridge overlooking the River Somme in Amiens, the administrative capital of the Picardy region of France, some 120 kilometres north of Paris. Cathedral of Saint Stephen of Metz, also known as Metz Cathedral, is a historic Roman Catholic cathedral in Metz, capital of Lorraine, France. Saint-Étienne de Metz is the cathedral of the Roman Catholic Diocese of Metz and the seat of the Bishop of Metz, currently Pierre Raffin. The cathedral treasury exhibits the millennium rich collection of the Bishopric of Metz, including paraments and items used for the Eucharist. The larger medieval churches of France and England, the cathedrals and abbeys, have much in common architecturally, an east–west orientation, an external emphasis on the west front and its doors, long arcaded interiors, high vaulted roofs and windows filled with stained glass. The eastern end of the building contains the Sanctuary and the Altar. Le Mans Cathedral is a Catholic church situated in Le Mans, France. The cathedral is dedicated to Saint Julian of Le Mans, the city's first bishop, who established Christianity in the area around the beginning of the 4th century. Its construction dated from the 6th through the 14th century, and it features many French Gothic elements. 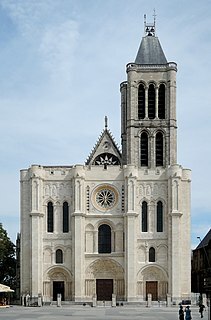 The medieval Collegiate Church of Our Lady of Mantes,, is a large and historically important Catholic church constructed between c.1155 and 1350 in the small town of Mantes-la-Jolie, about 50 km (30 mi) west of Paris. Although not a cathedral it was built on a cathedral-like scale. Its grandeur, its quirky design and its strong associations with the Capetian dynasty make the church particularly interesting to architectural historians.